The Security Council required Iraq to unconditionally accept the destruction, removal or rendering harmless, under international supervision, of all chemical weapons and all stocks of agents and all related subsystems and components and all research, development, support and manufacturing facilities (para. 8 (a) of resolution 687 (1991)). Iraq is required to submit to the Secretary-General, within 15 days of the adoption of resolution 687 (1991), a declaration of the locations, amounts and types of all items just mentioned in the chemical area (para. 9 (a) of resolution 687 (1991)). Iraq is further required to agree to urgent, on-site inspection by the Special Commission of its chemical capabilities, based on Iraq's declarations and the designation of any additional locations by the Special Commission itself (para. 9 (a) of resolution 687 (1991)). Other acts required of Iraq include the yielding by Iraq of possession to the Special Commission for destruction, removal or rendering harmless of all chemical items specified in paragraph 37 of this report (para. 9 (b) (ii) of resolution 687 (1991)). 1. Precursor chemicals produced and procured More than 20 000 Some 4,000 tons of declared precursors are not verified owing to the absence of information sought by the Commission from suppliers. 2. Chemical warfare agents produced 3 850 Whether several hundred tons of additional chemical warfare agents were produced cannot be established owing to the uncertain quantities of precursors (mentioned in 1 above). 3. Chemical warfare agents consumed in the period from 1981 to 1988 2 870 No documents or information on the consumption of CW has been provided by Iraq to support the declared quantities consumed. Without supporting documents the verification of this part of the material balance is impossible. 4. Chemical warfare agents destroyed under UNSCOM supervision 690 Declared quantities were verified by the Commission. 5. Chemical warfare agents discarded during production, or destroyed during aerial bombardment in 1991 290 Iraq has not provided supporting documentation for 130 tons of chemical warfare agents declared to have been discarded or destroyed. 1. Empty munitions produced and procured 247 263 Some 107,500 empty casings have not been verified owing to the absence of information sought by the Commission from the suppliers. 2. Munitions filled with chemical warfare agents or components 152 119 Whether several thousand additional munitions were filled with chemical warfare agents cannot be established owing to the uncertain quantities of procured munitions (mentioned in 1 above). 3. Filled munitions consumed in the period from 1981 to 1988 101 080 No documents or information on the consumption of chemical munitions has been provided by Iraq to support the declared quantities consumed. Without supporting documents the verification of this part of the material balance is impossible. 4. Filled and empty munitions destroyed unilaterally by Iraq 29 172 Unilateral destruction of 15,620 munitions is not verifiable owing to the destruction methods used by Iraq (melting and demolition). 5. Filled and empty munitions destroyed under UNSCOM supervision 38 537 Declared quantities were verified by the Commission. 6. 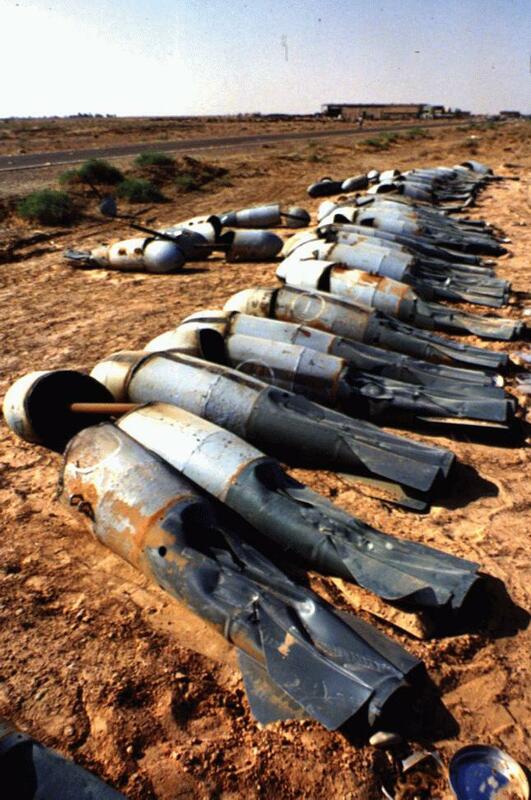 Filled and empty munitions discarded by Iraq or destroyed during aerial bombardment in 1991 78 264 Iraq has not provided supporting documentation for 16,038 discarded chemical munitions. Note. The margin of error in the accounting presented by Iraq is in the neighbourhood of 200 munitions. UNSCOM has sought to resolve the most important outstanding issues, which include the verification of the material balance of special munitions, including the accounting for 550 artillery shells filled with mustard chemical warfare agent, verification of the unilateral destruction of R-400 chemical and biological aerial bombs, and the provision by Iraq of the document sighted during the inspection at the headquarters of the Iraqi Air Force; accounting for the production of the chemical warfare agent VX; and verification of the completeness of declarations provided by Iraq on the material balance of chemical weapons production equipment [S/1998/920]. UNSCOM determined that 197 pieces of glass chemical weapons production equipment had been removed by Iraq from the Muthanna State Establishment, Iraq's prime chemical weapons production site, in 1991, prior to the arrival in Iraq of the first inspection team. This equipment has been repeatedly moved in shipping containers between several facilities in Iraq in the period 1991-1996. This equipment was destroyed under UNSCOM supervision in 1997. UNSCOM asked Iraq to provide clarifications on the movement of all such equipment. Iraq presented its clarifications to the Commission in July 1998. However, field verification, which is required, has been blocked since Iraq's 5 August 1998 decision to cease cooperation with UNSCOM [S/1998/920]. Iraq denies that it weaponized VX. Sampling by UNSCOM of special warheads has thrown significant doubt upon this claim [S/1998/920]. Iraq stated that the VX it did succeed in producing had poor stability. Through sampling, however, UNSCOM said it has found traces of a VX stabilizer, indicating that in all probability the VX produced by Iraq was more stable than they have thus far admitted. [UNSCOM June 98] In April 1998 UNSCOM decided to remove some remnants of special missile warheads destroyed unilaterally by Iraq and sample them in a laboratory outside Iraq. The purpose was to verify Iraq's declarations on the filling of the special warheads. This followed Iraq's protracted refusal to permit the removal of missile remnants which the Commission, in the beginning of November 1996, had excavated for analysis abroad. Forty-four metal fragments of different types of warheads were selected for sampling. Initially Iraq did not permit the removal of samples for analysis. In May 1998, the samples were sent for analysis to a laboratory in the United States of America. This analysis was completed by mid-June. 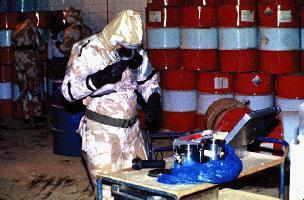 Degradation products of the chemical warfare agent VX were found in some samples. In September 1998, the Commission held an international expert meeting, with the participation of specialists from the laboratories involved in the analysis of samples. In addition, experts from China, the Russian Federation and the United Kingdom of Great Britain and Northern Ireland attended the meeting. [S/1998/920]. On 22-23 October 1998 UNSCOM held in New York a meeting of international experts on the issue of VX. 21 experts from seven countries (China, France, Russian Federation, Sweden, Switzerland, United Kingdom, and the United States), and experts from the Special Commission, participated in the meeting. Both Swiss and French laboratories found chemicals known to be degradation products of a decontamination compound. The existence of VX degradation products conflicts with Iraq's declarations that the unilaterally destroyed special warheads had never been filled with any CW agents [UNSCOM VX-3]. In 1991 Iraq declared that they had 12,792 chemical-filled munitions. During the period 1991-1994 these munitions were destroyed under UNSCOM supervision. In 1996, after UNSCOM obtained some storage inventories relating to these munitions, Iraq declared that they actually had closer to 13,500 munitions, but that 550 were destroyed during the Gulf war. Iraq, however, was unable to locate the site of their destruction. [UNSCOM June 98] Iraq declared that the 550 155mm shells filled with mustard had been lost shortly after the Gulf war, and no evidence of the missing munitions has been found. A dozen mustard-filled shells were recovered at a former chemical weapons storage facility in the period 1997-1998. The chemical sampling of these munitions in April 1998 revealed that the mustard was still of the highest quality. After seven years, the purity of mustard ranged between 94 per cent and 97 per cent. Iraq still has to account for the missing shells and to provide verifiable evidence of their disposition. In July 1998, Iraq promised to provide clarifications on this matter. To date, only preliminary information has been provided by Iraq on its continuing internal investigation[S/1998/920]. Among 1,550 R-400 aerial bombs produced by Iraq, more than 1,000 bombs were declared as destroyed unilaterally by Iraq, including 157 bombs stated as filled with biological warfare agents. The accounting for about 500 bombs unilaterally destroyed was not possible owing to the state and extent of destruction. In order to bridge the gap, UNSCOM requested Iraq to provide the documentation on the disposition of the tail parachute sections of R-400 bombs. The accounting for these components would enable the Commission to verify the maximum number of R-400 bombs, which Iraq could have produced. Iraq presented the information sought on the disposition of tail sections but field inspection activities are still required.